George Rodrigue’s newest paintings, his most important collection in years coming out of New Orleans, are huge, most 4x6 feet or larger. 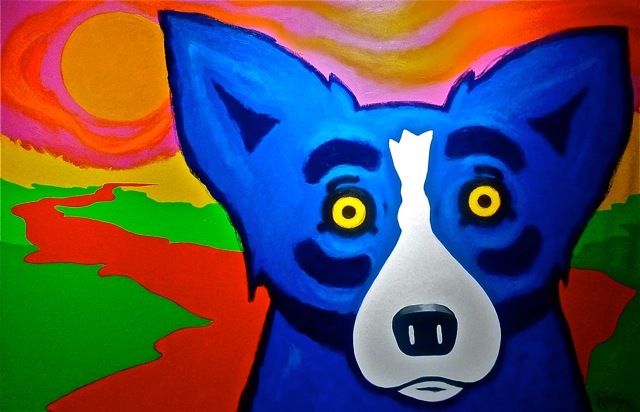 Normally he paints in his studio in Carmel Valley, California, with long days at his easel and, aside from the occasional houseguest, few interruptions. This year for the first time in more than a decade, we’re in New Orleans for the summer, foregoing our usual road trips and the central California cool weather in favor of a statewide Louisiana museum tour organized by the New Orleans Museum of Art (currently at the LSU Museum of Art in Baton Rouge). 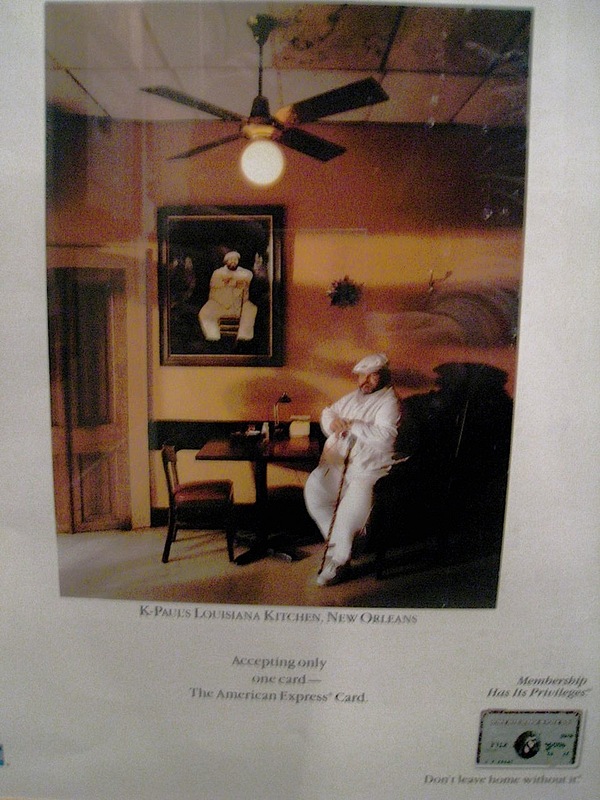 For George, this has made for less than ideal painting conditions, as our time in New Orleans is fragmented between lectures, foundation events, social obligations and more, as we follow through on our commitment to promote these exhibitions with personal appearances. 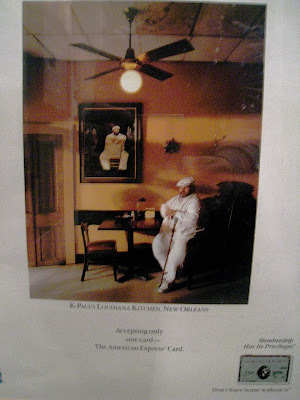 Surprisingly, we’ve never toured Louisiana in one concentrated, artsy trek. 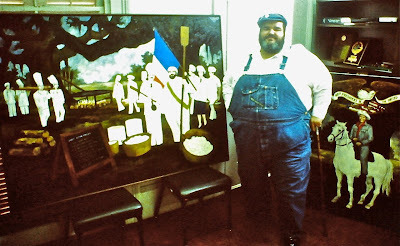 In the past, George might show once every few years in a Louisiana museum, with interim exhibitions outside of the state. 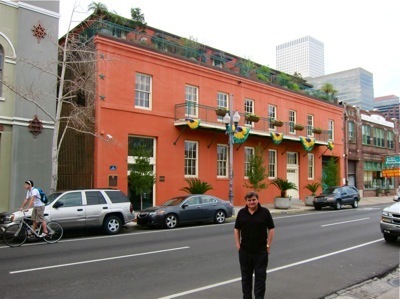 George and I laughed about her comment for years, not realizing we would attempt that very thing, with museums rather than bookstores, and seven locations, rather than thirty, but an ambitious tour nonetheless. 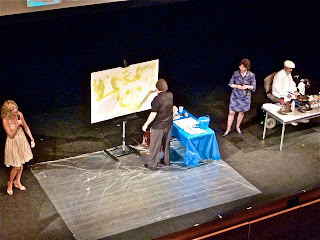 As a result, George paints in spurts, his least favorite way of working. 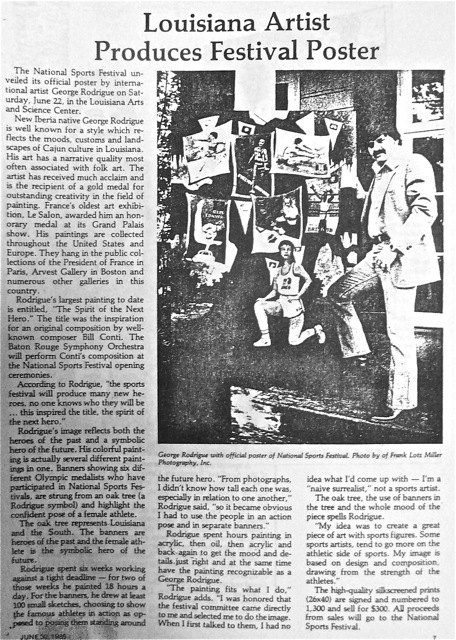 It’s for this reason that I’m surprised at the magnificent paintings coming out of his studio. 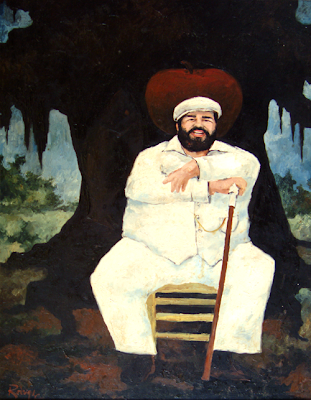 It turns out that, despite the interruptions, Louisiana inspires George more than ever. 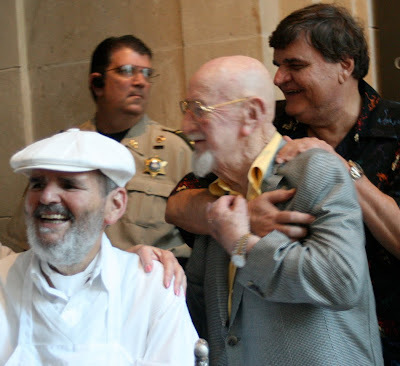 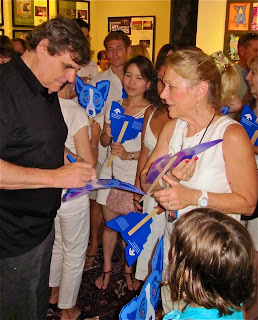 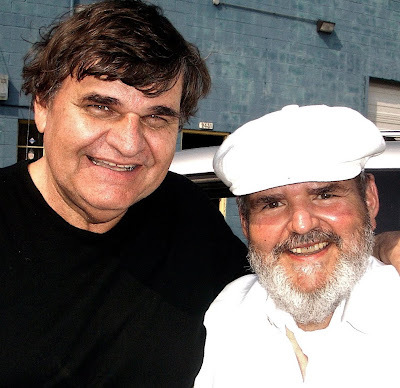 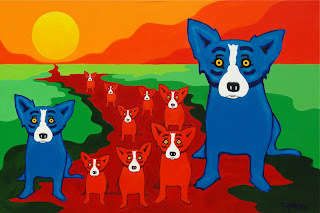 This tour, its events, and its visitors; the creative and eager children associated with the George Rodrigue Foundation of the Arts; and especially the large walls of his new gallery space obviously affect George as he thinks creatively. 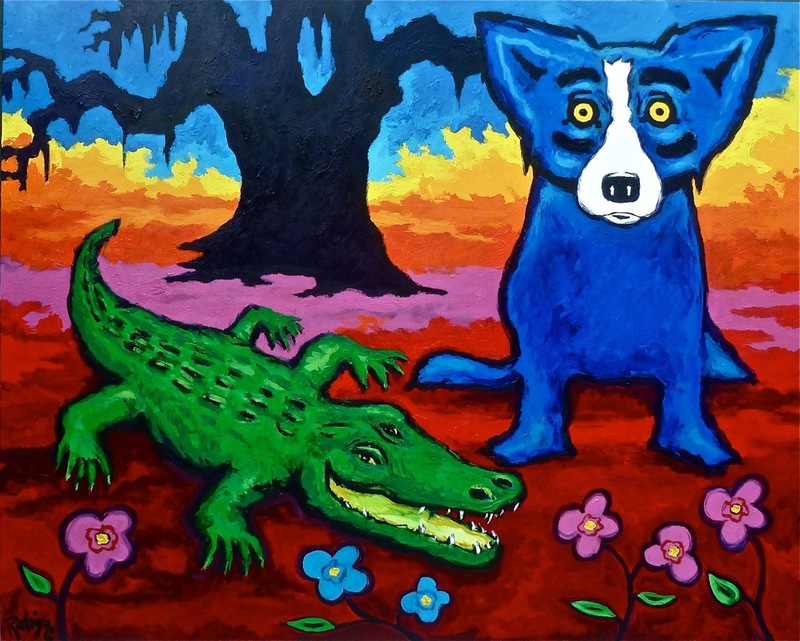 A number of the new paintings are related directly to the exhibitions, such as “Blue Dogs and Cajuns on the River,” pictured above, on view currently at the LSU Museum of Art, and detailed in its own post here. 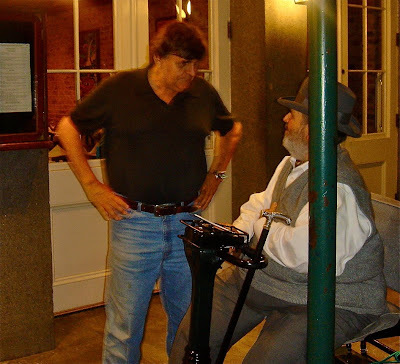 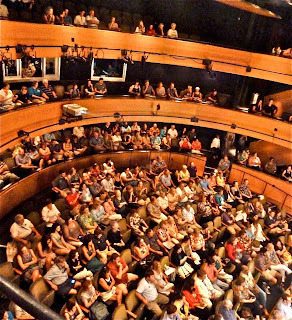 Most recently, however, George is thinking about Shreveport (Sept. 23 – Dec. 30), the last stop on the tour. 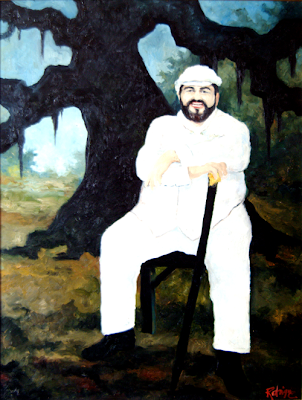 He has a long history with this northern Louisiana city (which I’ll detail in a blog post in a few weeks), and the idea of the red river sits well with an artist who focuses on color and strong design, even as he paints Louisiana, its rivers and roads blending as one, and its oak trees strong, repeated shapes since his earliest landscapes. 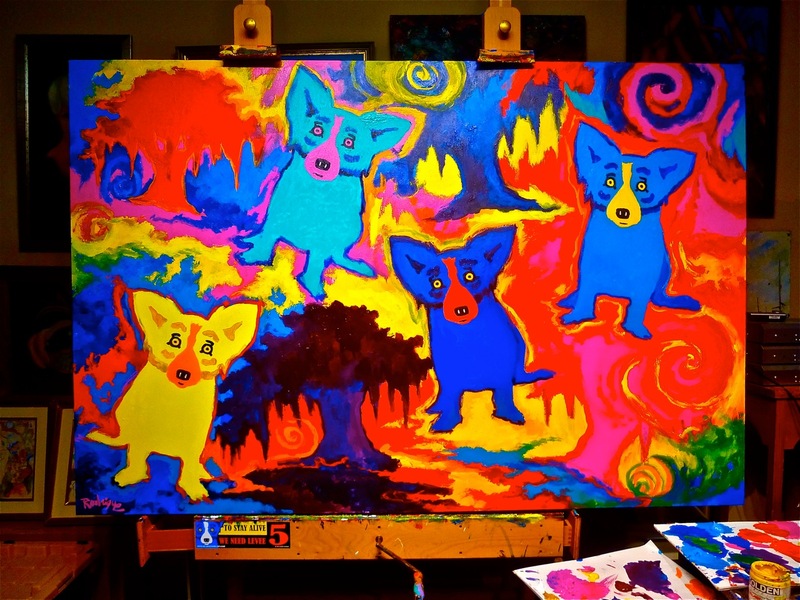 George Rodrigue's newest painting, Four Oaks for Four Dogs, finished just this week, combines his Oak Trees, Hurricanes and Blue Dogs, all in a swirling, abstract mass, reflective, he says, of his mood after months on the road enjoying the landscape, the people, and the oddly comforting heat of the state we love. 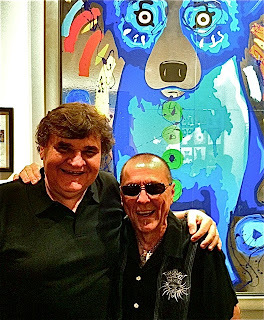 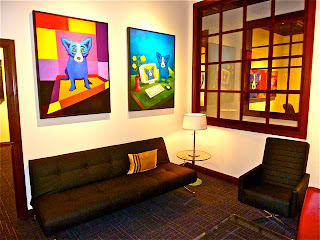 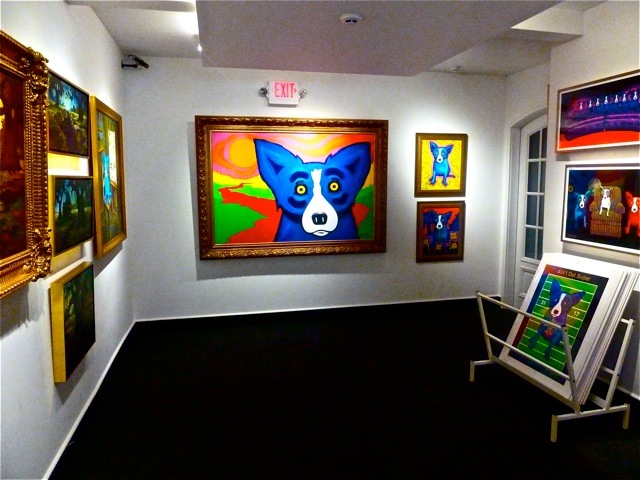 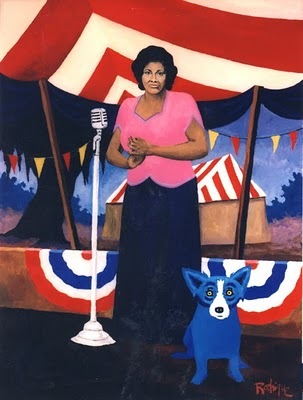 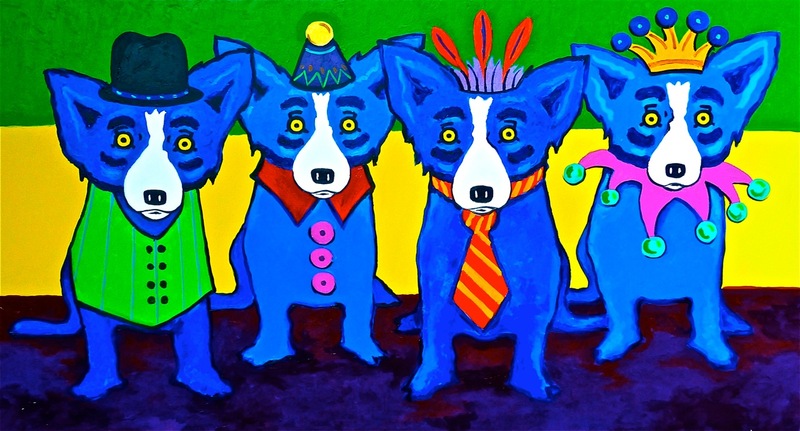 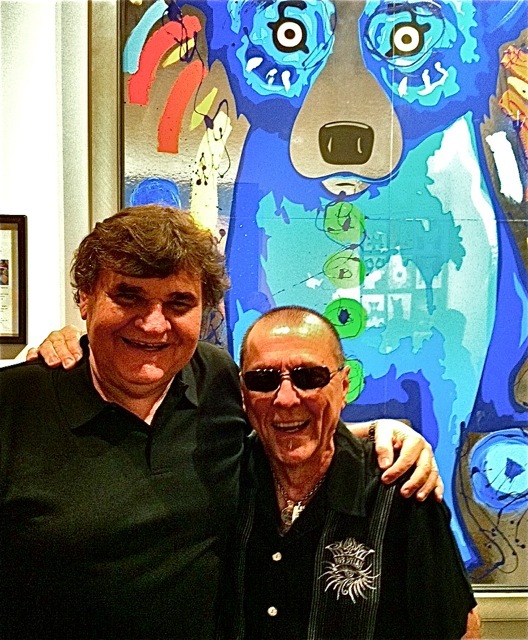 See George Rodrigue’s latest original paintings, sprinkled throughout this post, at his gallery in New Orleans. 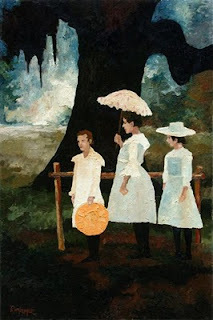 If you can't make it to the gallery, perhaps we'll see you in Baton Rouge or Shreveport, or even on the Florida Gulf Coast where we present a series of lectures, school visits, and an exhibition late September with the Mattie Kelly Arts Center and Foundation (more details posting soon), or next summer in ....big announcement... the Texas Panhandle, for an exhibition at the Amarillo Museum of Art. 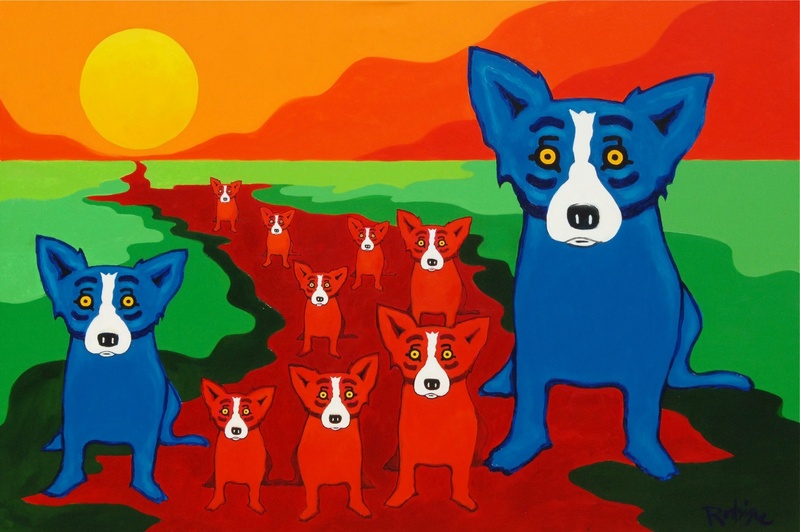 This week George Rodrigue unveils his large-scale painting The Spirit of the Next Hero, on view for the first time since he painted it in 1985 as the official poster for the National Sports Festival, an annual event renamed the U.S. Olympic Festival the following year. 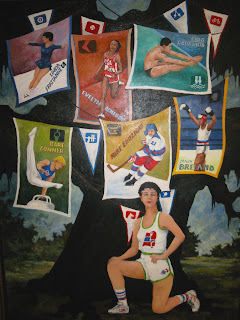 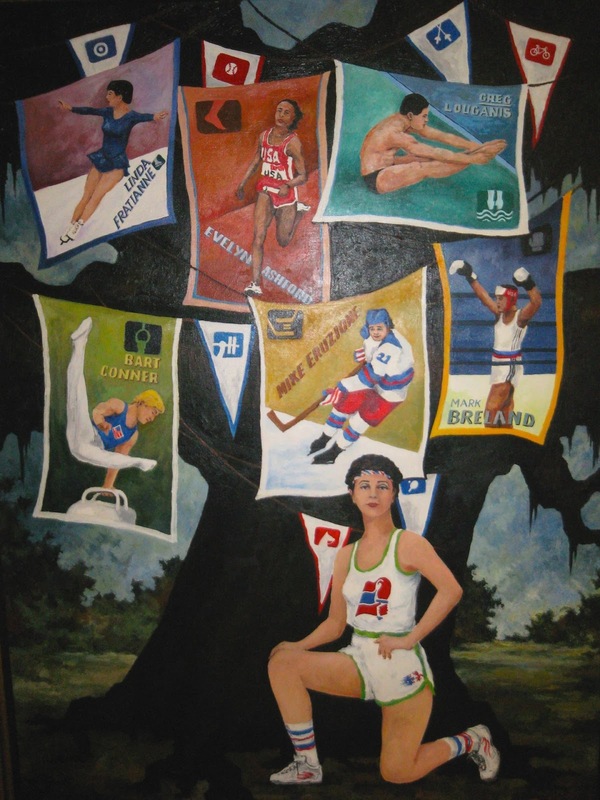 Named for composer (of Rocky theme-song fame) Bill Conti’s original composition “The Spirit of the Next Hero,” Rodrigue focused his painting on the Olympic gold medal winners, represented on banners hanging behind, and the spirit of the future Olympian, in this case a confident female athlete. Silkscreen prints from the painting benefited the National Sports Festival. 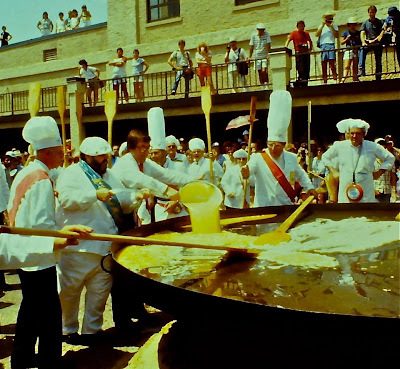 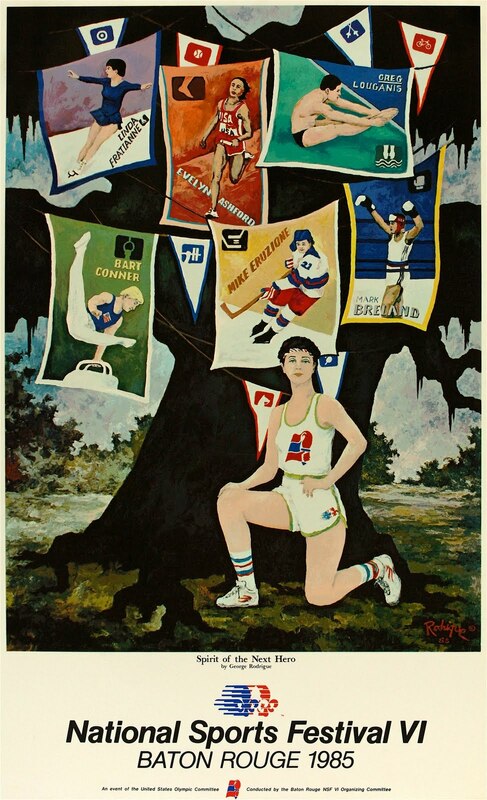 Originally the painting and print were unveiled at a gala event in Baton Rouge at the Louisiana Arts and Science Center, kicking off the 1985 festival with the visiting athletes. 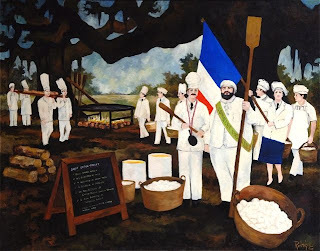 Rodrigue signed prints during the evening as his friend Chef Paul Prudhomme served his signature dish, blackened redfish. 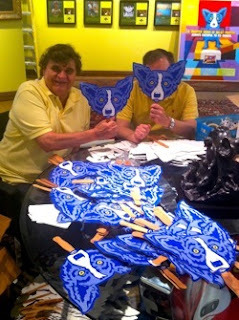 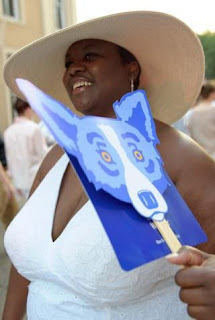 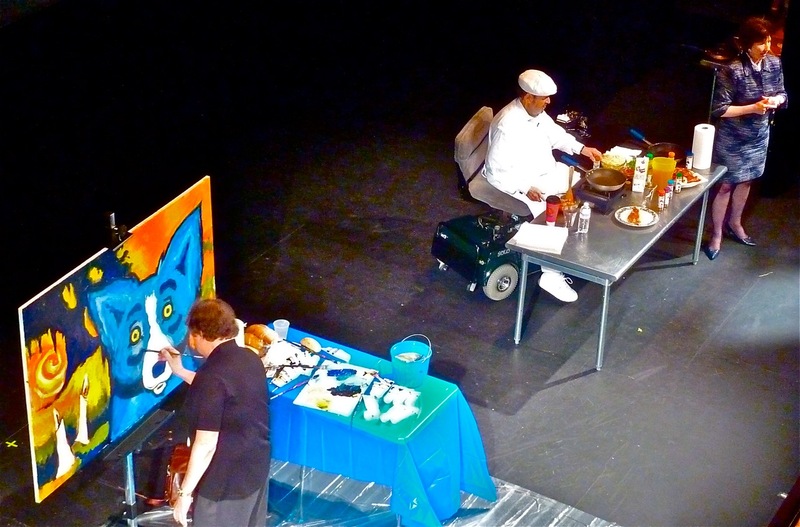 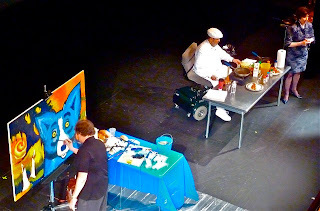 Not to worry if you missed that event, because you have another chance on August 20th 2011 when Rodrigue and Prudhomme once again present together in Baton Rouge, this time at the LSU Museum of Art during the exhibition “Blue Dogs and Cajuns on the River,” featuring Prudhomme in Rodrigue's Great Cajun Omelet (pictured above and detailed here). 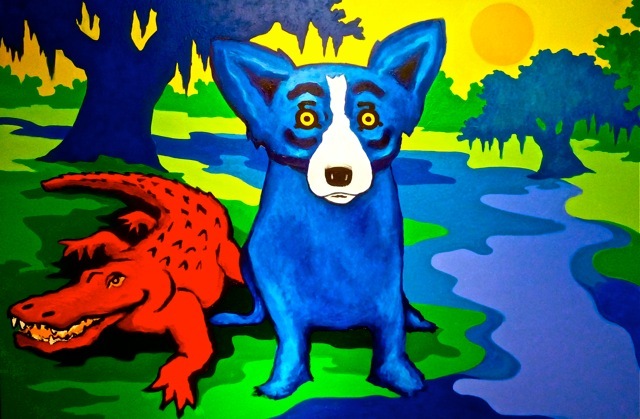 Through a series of circumstances and generous patrons, the George Rodrigue Foundation of the Arts obtained the inspiring painting, The Spirit of the Next Hero, for its new education center at 747 Magazine Street in the New Orleans Arts District. 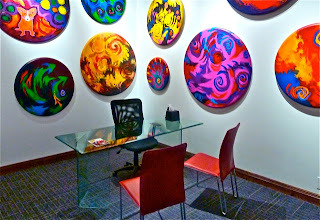 This Saturday, August 6th 2011 we unveil both our center and the painting during White Linen Night, an annual arts event sponsored by Whitney Bank and benefiting the Contemporary Arts Center. 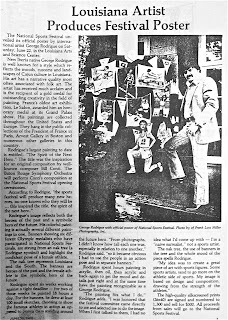 The painting joins other Rodrigue portraits, including authors Walker Percy and Shirley Ann Grau, along with a self-portrait of Rodrigue with political analyst Gus Weill. 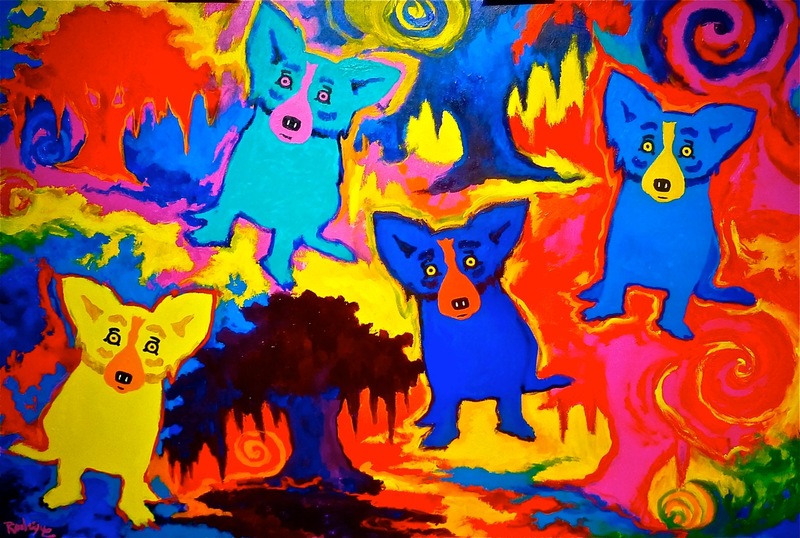 In addition to the portrait room, the center includes large-scale Cajun works such as Louisiana Cowboys and the Fais do-do, as well as an entire room of Hurricanes and important Blue Dog works from the Xerox Collection. 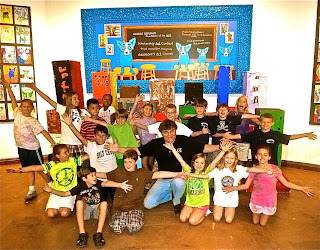 The education center is a focus of activity for the George Rodrigue Foundation of the Arts (GRFA), including both student and teacher workshops, as well as our annual scholarship contest, print donation program, and George’s Art Closet, providing art supplies to schools. 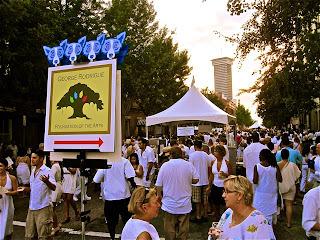 The original paintings star during White Linen Night this weekend, however, as canvases such as The Spirit of the Next Hero, usually reserved for storage or museum loan due to their size, finally hang on permanent public view. 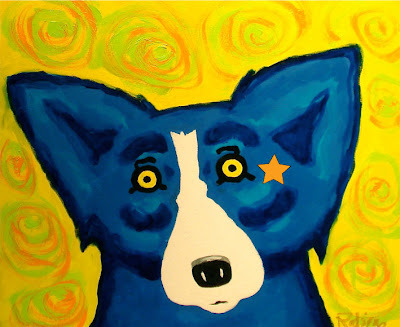 George and I hope to see you at 747 Magazine Street, near Julia Street, for a tour of paintings and programs this Saturday during White Linen Night and again next weekend at the Rodrigue Gallery in the French Quarter for Dirty Linen Night. 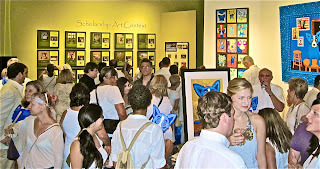 Come on out and support the arts. 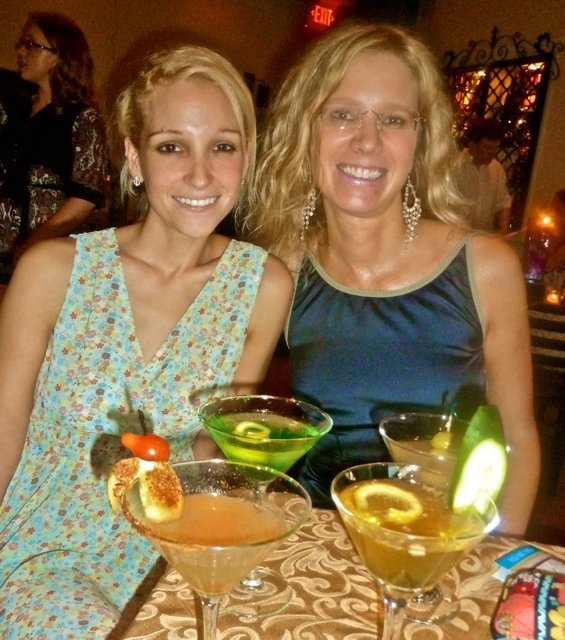 It's a great time!